Industrial distributors have lots and lots of products that they have to sell. Lots of products, good products—some of which get lost because salespeople are always looking for what is simple to sell that will generate the highest compensation; however, this creates a major problem. There is little opportunity to cross-sell and up-sell. Most products from a distributor are in a product catalog or in an inventory system. The products are not visible to the client during the sales cycle. Part of the reason products are not visible during a sales cycle is because the items are not meant to solve a customer’s specific problem. For a salesperson who’s trying to solve a specific customer issue, it may take weeks to research potential products, test solutions, present alternatives, create pricing and so on. What if a salesperson could identify the customer issue, ask a few questions about this issue and guide the customer to several viable alternatives? With these questions answered, the salesperson could then develop a proposal immediately with the customer that is accurate and profitable. What kind of impact would that have on customer satisfaction and sales results? What if sales management could see all of the items quoted, if they resulted in an order and what margin was quoted and sold? Would access to all of this data create a better operating organization? 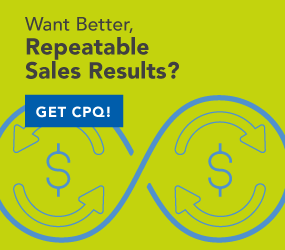 Putting all products into a product catalog that is driven by a guided selling application, such as a CPQ (Configure Price Quote) system is the solution. Ask a few questions relating to a customer issue, and quickly derive what products would be possible solutions. Products are sold quickly, accurately and profitably. Now the system will look for the up-sell and cross-sell opportunities that add significant value for the customer (and additional revenue for the distributor without adding additional sales cycles). The CPQ/guided selling application can be created with all products for the distributor salespeople. A web-based guided selling application can be created with a subset of key products for a business-to-business and/or a business-to-consumer eCommerce solution. The critical point in the selling opportunity is to drive the product information and purchase information as close to the purchase decision-maker as possible.